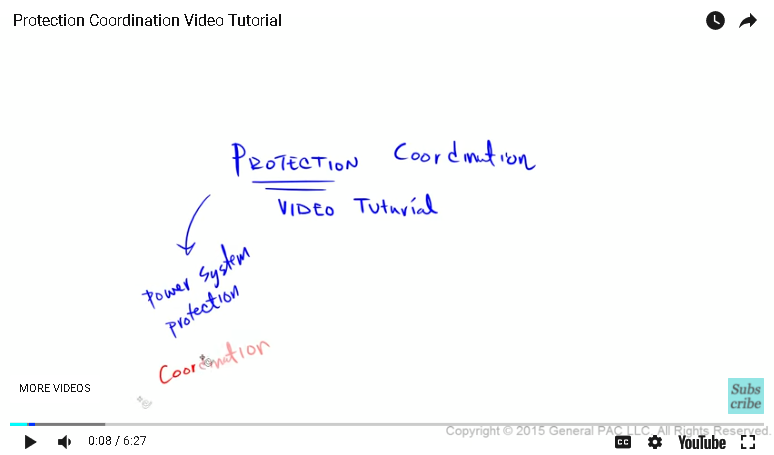 Protection coordination video tutorial and when we talk about protection, we're talking about power system protection and our coordination plays a role in power system protection. 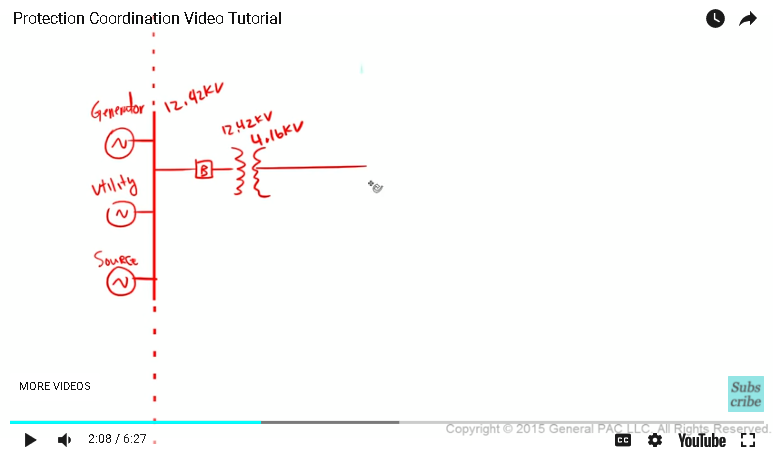 Okay, so in this video tutorial, we'll ask ourselves what is coordination and why coordinate at all? So, let's forget all the fancy terms and talk about what we want plainly. So, what we want is number one, reduce exposure and isolate a problem or an outage. This is pretty simple to grasp. We don't want the outage to cascade. All right. So, the second thing we want is to limit the duration of a problem or an outage. We don't want to take an outage longer than we have to. Okay, and number three, we want to minimize the actual problem and what I mean by that is to actually minimize equipment damage. This is what we want from our electrical system and coordination is going to help us achieve it. 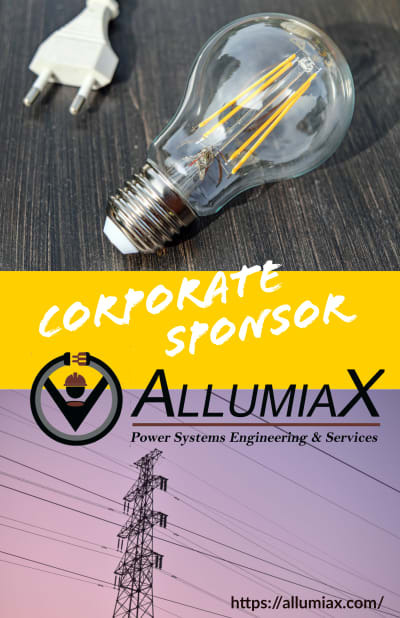 It's really important to keep in mind that electrical systems must be designed to prevent human injury. So, the number one priority should be safety. So, if we were to summarize coordination in a few and simple words, it would be coordination is essentially to minimize and isolate the problem, so the duration of an outage is minimal. So, let's quickly give an example of this all right. So, supposed that we worked at an industrial facility. So, in this facility we might have a generator that's generating voltage. We might have an incoming line from like a utility or the grid or we may have some external source. It doesn't matter what it is, right? As long as we're receiving power. And, suppose that we have a breaker on the high side of a step down transformer. 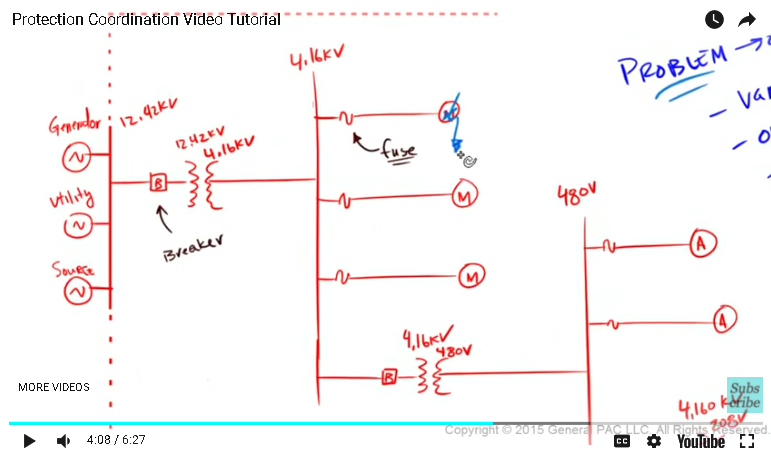 Suppose the generator was generating voltage at 12.4 KV and the step down transformer steps it down to 4.16 KV. and then it goes to the 4.16KV bus and on that bus, let's say we have a tap and this tap is fused and it's going to a motor, okay. And this bus here is 4.16 KV, okay. And then we have another tap and another motor. which our fuse that's going to our auxiliary motor or an auxiliary equipment. And then suppose we had another step down transformer that was protected by a breaker that steps the voltage down from 4160 volts to 208 volts and here we're feeding all the outlets of our facility. Okay, so a problem can be anything right. A problem that causes an outage. It could be various types of short circuits. It could be overload, harmonic problems, insulation failure, lightning, loss of synchronism or simply human error or natural disasters. So, a problem is essentially an abnormality that's not normal or uncommon and our protection coordination, it's supposed to do these three things. It's supposed to reduce the exposure and isolate the problem. It's supposed to limit the duration of the problem and it's supposed to actually minimize the actual problem, so the damage is minimum. Okay, so let's see how that works. So, suppose that we had a fault or any sort of problem on this motor. We should expect this fuse right here to number one, reduce the exposure of this problem. So reduce the problem area and they should also isolate the problem area. Okay, it should limit the duration of the problem or the outage, and number three, it should minimize the problem. Okay, suppose that this fuse, does not isolate the problem, so does not isolate the problem, so no isolate this fuse. What's going to happen? Well, the next upstream device, which is this breaker, we should expect this breaker to isolate the problem, but what happens if this breaker isolates the problem? Well, what was a single problem on this single motor has now affected everything downstream. It has effected all the motors that are off of this 4.16 KV bus. which means it did not coordinate, which means that the three rules that we wrote for ourselves, were not applied. A miscoordination does not fulfill or achieve rule number one. A miscoordination does not achieve rule number two and a miscoordination certainly does not achieve rule number three. So, to put it very simply, coordination minimizes and isolates the problem, so the duration of an outage is minimum. And that concludes this short video tutorial. If you like this video, consider liking and subscribing. 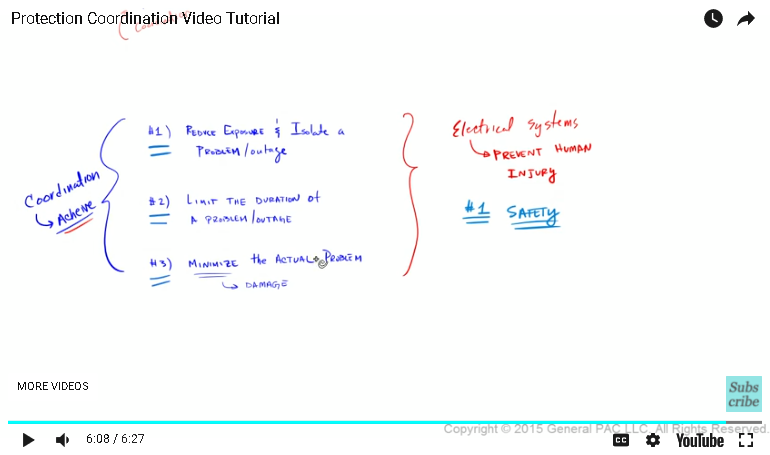 This video was brought to you by GeneralPack.com making power system protection, automation and control intuitive.